For more information on what we are learning, please see our class page. Our children will access an environment that encourages them to learn and develop with confidence to become independent active thinkers. Children will be treated fairly and will develop a positive image of themselves and others. We will listen carefully to children and build meaningful reciprocal relationships between adults and children and their families. 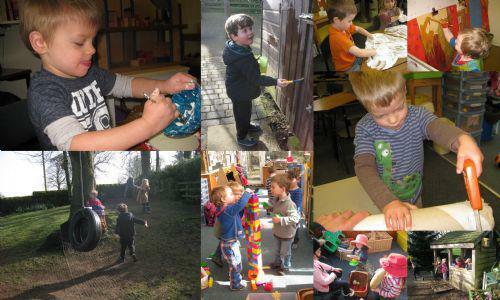 During the sessions, we provide a combination of varied free-play and adult led activities, indoors and outside, planned around the interests and needs of each child. Our ‘Vision’ display gives a flavour of how the children spend their time with us and a little information about the Early Years Foundation Stage Curriculum. If you want more information about the curriculum just ask us. Our staff will always be present during these sessions. At Kettlesing Felliscliffe Pre School, your child will be treated as the individual that they are, and will be encouraged to pursue their interests and ideas in a thoughtfully resourced environment. This means your child will not be expected to produce crafts or art to please us or you; rather they will be encouraged to experiment and question, be curious and discover. We will keep a record of your child’s time with us on Tapestry, an online learning journal. We would like you to look on Tapestry frequently and add pictures of what that have been up to at home. Nursery often has messy activities and always paint, so your child will need to wear ‘old’ clothes or ones they don’t need to worry about. Your child will also need to have outdoor clothes with them - coat, hat, gloves, sunhat depending on the season or weather. We play out in all weathers at all times of year if the children want to. It is good for children to practise skills which will make them independent. Simple clothing, which they can handle themselves will enable them to go to the toilet when they want to and to put on/take off outdoor clothes. Children are encouraged to bring things in to ‘show’ especially items which they are keen to tell us about. These will be placed in a tray by the door for safekeeping during the session. Please remember to collect items at the end of the session. Places for three and four year olds are funded by North Yorkshire. Children will become eligible for the funding from the beginning of the full term following their 3rd birthday. Fees for none eligible children are £15.00 per session. You will be invoiced half-termly in advance. In order to keep our fees as low as possible, we are not able to give refunds for missed sessions. A minimum of two session needs to be booked. We are keen for parents to be involved in our nursery. If you feel you can contribute in any way, please let us know! If your child is unwell and unable to attend pre-school, please contact us on 01423 770576. This especially important if you suspect something infectious. Please do not send your child to pre-school if they have been sick or had diarrhoea in the previous 48 hours. Please always tell a member of staff if someone other than yourself is to collect your child. Once again welcome to Kettlesing Felliscliffe Pre School, we look forward to having you with us. If you have any other questions please do not hesitate to contact us or ask us when you start.